At Kamerawerk we have a tradition of shooting our own projects to advance our skills and create state-of-the-art showcases for our clients. We aim to demonstrate what is technically and creatively possible, so when I played with the idea of shooting a stereoscopic short film entirely with high-speed cameras, the team was very enthusiastic. After pondering the possibilities and challenges for a while, we talked to Weisscam and P+S Technik about it, and the project started to take shape very quickly. Initially we wanted to shoot some tests, but when actors, locations and crew all started to fall into place in early February 2011, we decided to shoot the entire film straight away. It was our goal to make a film which uses the technology to create something unique, something that wouldn’t be possible without it. We wanted to convey the impression of flight and weightlessness in space – an immersive, purely visual and poetical experience for audiences. With that in mind, RISE was shaped more like a dream than a short film, where a young woman suddenly begins to fly as if gravity were suspended. We rented a huge trampoline on which our rising beauty would be jumping. The idea was to only use the phases where she is rising (or reversing her descent) so as to create the impression that our cast is completely weightless and continually ascends through space after an initial lift-off from the ground. Of course the trampoline was always kept out of frame. The trampoline on which the model jumped, and the scaffold constructed for the camera location. We wanted to shoot on location as opposed to shooting against a green screen, so we had to find a location big enough to carry out the project and that had a backdrop with very little horizontal structure, so the viewer would have no reference that our model is floating in the same spot all of the time. We finally found an old warehouse in Winterthur, Switzerland, which was perfect for the job. It also allowed us to release water and other materials from buckets suspended from cranes at the ceiling onto the model while in mid-air. Water and other materials were released from cranes as the model was in mid-air. Since we were shooting with two Weisscam HS-2 cameras on our P+S Technik Standard rig, we needed a suitable support system to get the camera to a height where we would catch our model in flight without seeing the trampoline. The solution was to rent a scaffold from a local construction company. While the camera rig was operated from the scaffold, we set up the DIT (Digital Imaging Technician) station right behind it, where the RAW signals from the HS-2s could be recorded onto Weisscam DigiMag DM-2s. We also setup a 46″ polarised JVC 3D display to review each shot at 25p playback in 3D as it was recorded to the DigiMags. The Wiesscam HS-2s mounted on a P+S Standard mirror rig. During production, the few seconds captured in realtime at up to 2000fps ended up running for a few minutes on playout. 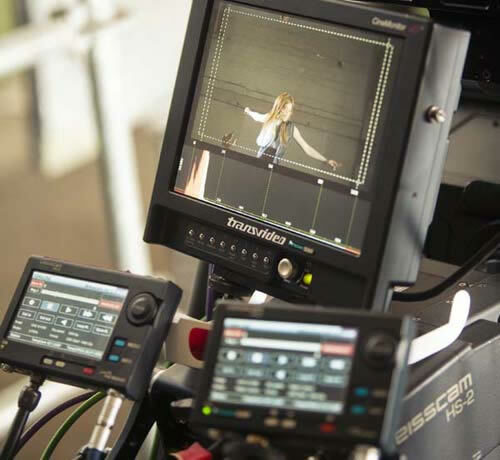 Using AJA frame syncs to synchronise the signals for on-set playback in 3D on the JVC display, gave me, the director, a chance to review the result as it was being recorded. I could immediately reject a recording the moment I noticed that a take didn’t yield the desired result in order to save time on set and to save drive space (we ended up recording some 4TB in two days). The challenge as a director on a high-speed 3D production is to see that desired moment during realtime capture, and call ‘cut’ before it is eaten up in the ring buffer of the HS-2. Otherwise there’s nothing useful to record during 25p playback. The crew watching playout on a JVC 46" polarised 3D monitor. Since the Weisscam RAW codec is not 3D-muxed (meaning left and right streams are recorded into one file as is the case with an SI-2K 3D setup for instance), but recorded individually into separate files, we anticipated that syncing the 3D footage in post could turn out to be a challenge. Imagine visually identifying a sync problem between left and right images when the difference is 1/1000 of a second! As it turns out this looks more like a geometric offset at first. A traditional head slate is not an option with the maximum recording time of less than 10 seconds at the frame rates we were shooting with. By the time the slate were moved out of the frame and the action had taken place, the slate would have been eaten up in the ring buffer, with no decent sync mark in place anymore. The same problem arises when using a tail slate. The clapper would have to move at the speed of light in order to position the slate and clap it before the valuable footage is recorded over. But the speed of light was precisely our solution! We used professional photo strobes with a flash duration of about 1/1500s. These were positioned to illuminate some darker areas of the frame and were fired wirelessly by an assistant as soon as I called ‘cut’. A perfect lightning-speed 3D sync marker! At the end of the day, the genlock did the major work, and the sync was consistently off by only one frame anyway – although it would have taken a while to ascertain that fact without the strobe. A helpful side effect of this method was that it also gave the DIT department a heads up when the realtime transfer from the cameras to the DigiMags could be stopped, saving additional time because we didn’t wait to record useless minutes of footage at the end of a take. The stereography was done using the P+S Standard rig. Christian Witschi, our stereographer, was able to set convergence and IA (interaxial) with little effort thanks to a synchronised output on a Transvideo monitor. The stereo depth was calculated with high-speed 3D in mind, where the audience really has time to evaluate an image. This means that even with a relatively small IA, there is a large amount of perceived depth, simply because there is more time to see it. Stereographer Christian Witschi setting convergence and interaxial distance. We did not want RISE to be about effects and stuff flying at the audience, rather, we wanted it to be a showcase about high-speed 3D, and a pleasant experience for the viewer. As such, the depth budget was used almost entirely on the body of the model, ignoring possible divergence issues in the background, which had hardly any structure anyway. The synchronised video on the Transvideo monitor. The entire 3D space is taken up by the model, augmented by the particles around her. We felt that high-speed 3D material in general is much more like stereoscopic still photography with its own set of rules, and this also holds true for the lighting. It therefore made sense to use Stefan Schaufelberger, Kamerawerk’s very own S3D photographer, for the lighting in RISE. His approach to lighting, derived from his work as a still photographer in advertising, was perfectly suited to high-speed 3D. Whereas misplaced or distracting shadows or other weird lighting mishaps pass quickly and usually unnoticed in realtime footage, a high-speed image works more like a still image, and so the audience has much more time to notice anomalies. This means that the photographer has to work in great detail to make that one frame perfect, and adding 3D to the mix tends to draw even more attention to undesired artefacts. Stefan’s lighting really did the trick, helped along by high-speed ballasts! 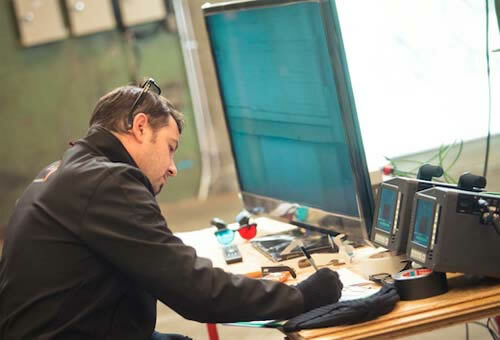 Claudio Sulser, our senior editor was on set during the entire production handling the DIT department. Of course this would prove to be advantageous on any production, but with a highly-technical project such as this, it was a blessing. We constantly discussed how things would come together and what was still missing in order to make a cohesive edit. On a technical level, his presence on set made for a smooth post production process. The RAW dailies were decoded in realtime using Iridas SpeedGrade DI. Editor Claudio Sulser was always on set to advise on what would make a cohesive edit. We made a few small adjustments, such as the one-frame sync shift and a minor one-pixel vertical shift, and rendered out to 8-bit side-by-side files for an offline edit in Final Cut Pro. From Claudio’s point of view as an editor, working in 3D is different, but editing high-speed 3D is even more so. Maintaining a visual flow in slow motion, taking 3D into account when making an edit, as well as keeping a pace so that audiences remain engaged, calls for a truly multidimensional mind, where technical aspects have to be settled in advance so that they don’t get in the way. After the picture lock, the offline edit was re-conformed via a simple, old-fashioned EDL to SpeedGrade DI, where the grading and depth balancing was done in only two days. For us it was rush – in every sense of the word – to produce RISE. Stereo 3D combined with high-speed capture is turning out to be an art form in its own right. It is like the world of photography and film meeting in space. Our clients and partners have been mesmerised by it, which has led to many new projects since, and we can see a multitude of applications in advertising, feature films and music videos for which high-speed stereo 3D will create stunning new visual experiences. Vimeo video Behind The Scenes of RISE. 2x full sets of P+S Technik Digital35 lenses. 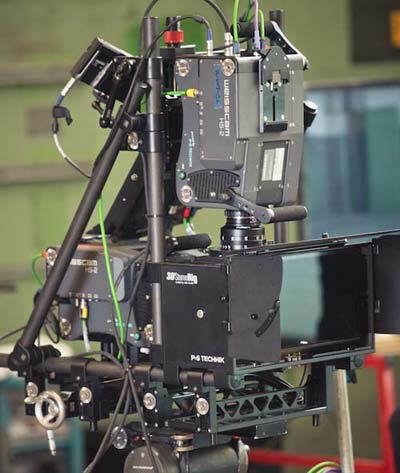 P+S Technik Standard 3D rig. 46″ polarised JVC 3D display. ARRI HMI 4K and 1.2K with 300Hz ballasts. Apple Final Cut Pro editing software. Nicolas Henri Sieber is an S3D Director and Producer for Kamerawerk GmbH, a Swiss-based film and photo production house specialising in stereoscopic 3D production. Kamerawerk delivers full service content creation from concept, creative writing, principal photography and post-production to final delivery in all media vectors.